Ambassador of the "Bedroom without Violence"
"Bedroom without Violence" is the third stage of the national awareness raising campaign "Home without Violence" which was launched in Belarus in 2012 as part of the project "Developing national capacity to counteract domestic violence in the Republic of Belarus" implemented jointly by the Ministry of Labour and Social Protection of the Republic of Belarus and the United Nations Population Fund. The overall goal of the campaign is to prevent and combat violence against women and children. "Home without Violence" was conceived as a three-stage campaign. The first stage - "Kitchen without Violence" with Yulia Vysotskaya - supported the operation of the national hotline for the survivors of domestic violence 8-801-100-8-801. As a result, during the three years of work the hotline received over 6 thousand calls. The second stage of the campaign - "Playroom without Violence" - focused on preventing violence against children and promotion of the webpage. The third stage of the campaign "Bedroom without Violence" intends to raise the awareness of the public of domestic violence, facilitate a shift from aggressive behaviour and attitude toward one's spouse/partner to non-violent behaviours and attitudes and suggest alternative ways of interacting within a family. Women account for 94.3% of calls to the hotline. Each tenth caller told about the restriction of freedom and movement, and almost as many callers reported manipulation and blackmail involving children. In 86.2% of cases the aggressor was male. Over one quarter of the survivors did not seek help anywhere previously. According to the Deputy Minister of Labour and Social Protection of the Republic of Belarus Alexander Rumak, dealing with the problem of domestic violence is an overriding priority for the public and the government. The well-being of the society as a whole depends to a large extent on how successful a family functions and how it meets its needs. "The purpose of my involvement in this awareness-raising campaign is to remind the people around us how important it is to preserve one's family, maintain the equality and respect for the members of the family. I use my family to demonstrate that aggression and violence are inexcusable", said Alexei Kalyuzhny. For 32.4% of men financial difficulties take the first place among the main reasons of spousal confrontation, and for 39.2% it is the unfair distribution of household duties. On the other hand, women more frequently mention such reasons as alcohol abuse and jealousy. In their turn, men more often mention intervention of parents as a factor provoking family conflicts (18.0% of men and 14.6% of women). According to the survey, violence resulted in disability for 2.4% of men and 9.5% of women, and 3.6% and 10.3% respectively had to seek medical attention. The analysis of the dynamics of violence recognition in 2008 and 2014 demonstrated that absolutely everyone can identify physical violence. The situation with psychological and sexual violence is different. For example, since 2008 the indicator of the recognition of sexual violence towards their partner by men has decreased by 13.3%. As part of the campaign a video, information leaflets and the updated version of ostanovinasilie.org website will be used to raise the awareness of the public of various types of domestic violence. "Our website www.ostanovinasilie.org has provided help and information support to the people subjected to domestic violence for three years now. Since its creation nearly 53,000 people have used the resources that the website provides, and 237 consultations have been provided. The new version of the website features tests you can take to see whether you are subjected to violence or committing violence against your close ones. Based on the test findings everyone can take advice on what is the best way out of the situation. 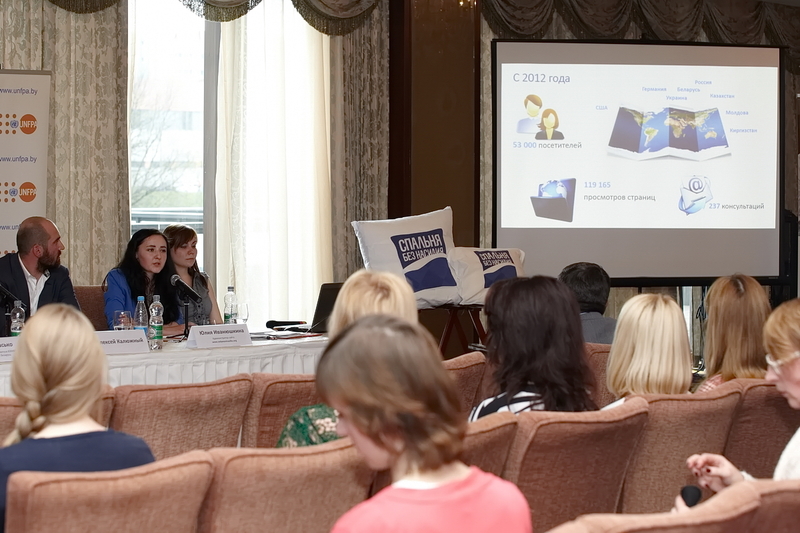 Generally, we hope that www.ostanovinasilie.org will continue to contribute to ending domestic violence", said Yulia Ivanyushkina, the manager of the website. "The problem of domestic violence concerns every single family member. That is why it is essential that government agencies, international organizations, non-governmental organizations, mass media and the private sector all join their efforts to address the problem of domestic violence. We hope that after the awareness-raising campaign there will be less violence and more happy families in Belarus", said Elena Kasko, Assistant Representative at UNFPA.